After spending the better part of four years studying, researching, and now writing about the impact of spoken word poetry in film and television, what has remained elusive is the presence of this style of poetry on network television. Tonight, however, Rudy Francisco will showcase this style when he performs on the Tonight Show with Jimmy Fallon. For most guests and performers, the Tonight Show is but one stop, one of the more fun stops, on a press tour for films, music, television and historically for showcasing upcoming comedians. In this way, Francisco is not so unique, as he is undoubtedly publicizing his newly released collection of poems, Helium (Button Poetry). Nor is he the first poet on the Tonight Show, as Maya Angelou has frequented the couch since her first appearance in the early 1970s. Actor Jimmy Stewart famously read a tearful poem about his dog, “Beau.” Both Johnny Carson and Jimmy Fallon have used poetry as comedic bits, most recently with Kobe Bryant, Samuel L. Jackson and Tom Hanks satirizing the style of poetry slams and beat poetry with poems about 1990s sitcoms. However, what is unique about Rudy’s appearance is that it might be the first truly spoken word poetry performance in the show’s 63 year history and on any network television late night talk show platforms. With respects to Danez Smith’s riveting performance on the Late Show with Stephen Colbert, his poem was part of a musical ensemble that featured Macklemore and Jamila Woods. Last year, actor Riz Ahmed delivered a piece about Islamaphobia and white nationalism on the Tonight Show. Yet despite his memorization, rhymes, and free-verse cadence, the poem lacked the style and polish of seasoned writers in the slam and spoken word communities. It is also worth noting that the short-lived Arsenio Hall Show reboot features many spoken word poets, including Rudy as a member of the poetry super-group, Fiveology. However, Arsenio’s television audience was dwarfed by the numbers of the other late night talk shows, thus limiting the circulation of these performances to primarily Black and niche viewers on YouTube. 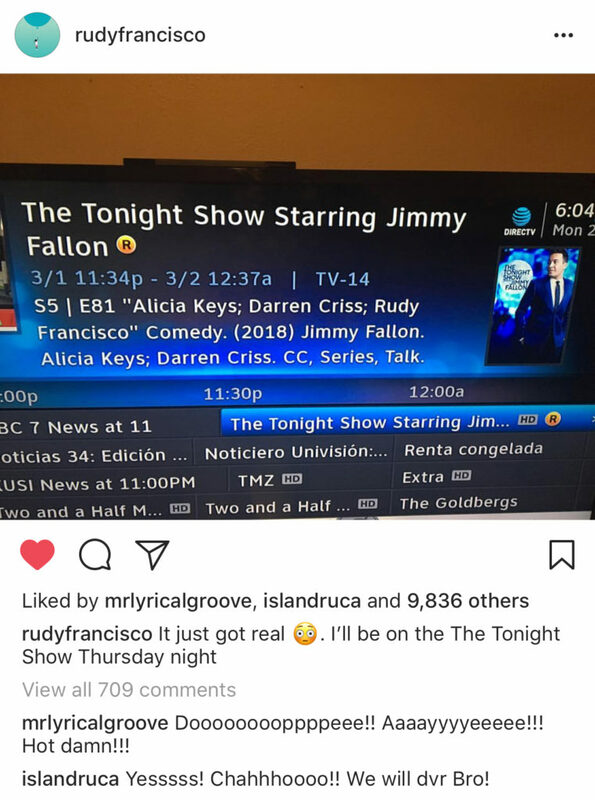 But tonight, when Rudy Francisco performs on the Tonight Show, it’ll be one of the few times a spoken word poem is performed in earnest on network television, without masking as a comedic bit, satire, or otherwise vehicle for humor. This is unquestionably a big deal, for Rudy, for his family, for Helium, for spoken word and performance poets, and for the general slam and spoken word community that includes fans, friends and supporters. What is yet to be determined, however, is if this is big enough to bring the style of spoken word into the mainstream. Along with that supposition comes a myriad of questions and issues: whether or not spoken word should seek to enter the mainstream; what are the consequences for spoken word entering the mainstream; whose voices might be cropped and whose voices might be propped in the mainstream; and of course who decides what poets/poems are “allowed” in and kept out of the mainstream? There are unfortunately no easy answers to these questions and the alternative to entering the mainstream hinders the opportunity for poets to fully participate in the economy of this art form and enjoy any decent standard of living. Thus spoken word, slam, performance poetry, and the artists who practice these forms must continue the discussion on the role of art as politics, praxis, social justice, entertainment, and aesthetics. It is a discussion that can hardly afford to dismiss the mainstream and commercial spaces for fear of contradicting the message, the spirit, and the movement for a socially just world. Instead, this discussion must consider the radical possibilities by which poets can affect some types of challenges, confrontations, and potential changes to the culture industry through mainstream and commercial spaces. If we believe that this is possible, then Rudy Francisco’s performance on the Tonight Show exhibits the capacity for spoken word poetry and the poets who perform to be incredible agents of change. It tells us that we can hold our conversations not only in the coffee shops, theaters, bookstores, and art galleries, but that we can bring these conversations into the living rooms and bedrooms of folks across the nation. On the other hand, if we do not believe this is possible, then Rudy’s performance will be really cool for most of us to watch and say “Yo, I liked that poem!” and if nothing else, isn’t that what keeps us writing and sharing? I am not neutral in my excitement about Rudy Francisco or the potential that this may create opportunities for other poets. I am certainly vested in the idea that poetry has the power to change the world in unquantifiable ways. Yet even more so, I am hopeful that a poem on the Tonight Show will resonate with a young person, a writer, or a person unsure of their voice. With this newfound inspiration, they will find the courage, like Rudy, to do whatever they can to change the world. After all, that’s how I became a poet.